The flexibility of the Canary Flex is certainly a massive selling point but we just felt that it didn't perform as well as it could or as well as it should when compared to competing cameras available for similar money. Canary's second entry into the cloud-based home security camera arena comes in the form of the Canary Flex. This new camera is designed to be versatile and easy-to-use. Place it anywhere in your home for peace of mind when you're away, or to capture footage of your family comings and goings with ease. In a market with a mass of competing cameras that include the Nest Cam, Nest Cam IQ, Withings Home, Logitech Circle and more, the Canary Flex features an IP65 rating, meaning it's all-weather capable. That, plus its rechargeable lithium-ion battery, means it can be used inside or out the house. Is such versatility enough to keep its competition at bay? The Canary Flex camera boasts a sleek, modern and compact design. Considering that the battery contained within the housing is expected to last up to two months, we're impressed with the size of it. The short tubular body sits nicely in the palm of the hand and so could easily be tucked out of sight. On the front of the camera there's a light ring to show it's charging or plugged in, alongside the camera lens, infrared motion sensors and microphone. The top of the camera houses the speaker and the back of the case hosts the charging port and power buttons. This charging port uses a proprietary cable to allow powering of the camera (or recharging should you choose to use it in battery mode) and this is helps to maintain the weatherproof rating. A detachable magnetic base offers flexible positioning according to your needs and the camera also comes with a wall-mounting kit which includes a wall plug and single screw. This is the first insight into how simple the Canary Flex is to setup, managed and use around the home. The included 2.4 metre cable isn't really long enough for outdoor use, so you will have to employ the battery if that's your planned use. It's worth considering that the Canary Flex isn't very secure either: it's only attached to the wall by a magnetic base so could easily be stolen if left within grabbing distance outside. That said, Canary also sell a secure mount to get around this problem, plus a number of other useful mounts for positioning around the home too. We were immediately impressed with how easy the Canary Flex was to setup. Pop it out of the box, plug it in, download the app, follow on-screen instructions and you're soon online and watching footage through the camera's eye. Initial connection is via Bluetooth from your phone, then you simply connect the camera to your home Wi-Fi network, create an account with Canary and you're away. The next step is placement. Canary recommends placing the camera out of direct sunlight with a good view of the room. The Canary Flex includes a 116° wide-angle lens, so it has a good view from most positions, but we really found varying lighting conditions to be a bit of a failing. The sensor just didn't cope well with varying light levels during our use. Even well-lit rooms the camera really struggles. We found ourselves having to reposition the camera multiple times before getting a usable picture of the room as any changes in light - like sunshine through a window, for example - ruined the footage and made it difficult to make out the rest of the room. We're happy to report it's a different story at night where the night-vision mode automatically kicks in. This gives a reasonably impressive view of the recorded area. Although the Canary Flex has a 1080p video sensor, it only actually streams footage to the cloud at 720p. And this really shows, especially when combined with the light-level problems. We found the recording quality to be disappointing, especially when you consider the other cameras on the market offering better quality footage at a similar price point. 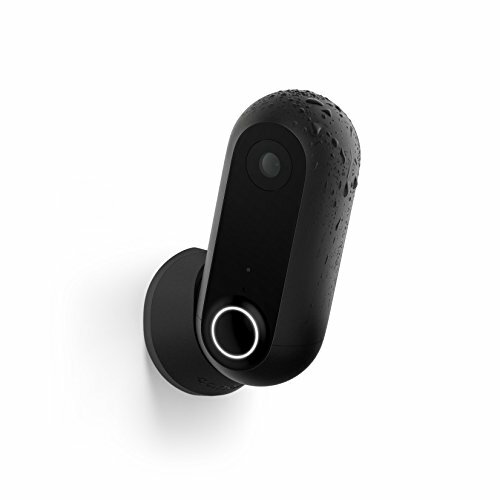 Like most other Wi-Fi connected cameras, the Canary Flex offers both "live" view and the review of "events" throughout the day. That is to say, there's a timeline of activity that the camera has detected for you to review. To save power, the camera only records when it detects movement unless you're reviewing live footage. There are a number of settings that you can tweak to suit your various needs, which we found to be pretty flexible and intuitive, including the frequency of notifications and whether the camera even records when you are home or is just set to private mode. You can set the camera to detect when you're home or away automatically based on the location of your phone (and that of family members' devices too) and adjust how it works accordingly. You can also choose the sensitivity level of the camera and the notifications to ensure you aren't bombarded with messages every time the camera detects the slightest movement in the room. Battery notifications are also pushed to your phone when the camera is fully charged or running out of juice, though we did find that we didn't receive a notification of a flat battery (for obvious reasons), thus meaning the camera went almost 24-hours without recording any footage. Clicking within the app to review live footage allows you to stream what the camera is seeing. We found there was a few seconds delay in the footage loading and a few seconds delay in the stream too, meaning you're not reviewing truly live footage which isn't ideal. One of the most appealing features of the Canary Flex is the battery life and the fact that it's capable of being used both indoors and out. Not too many other cameras offer this flexibility currently, so we wanted to test out how it stood up to both. For outdoor use, the wireless ability is especially appealing and Canary says the Flex can last up to two months on a single charge. However, during testing, we found that the camera ran out of juice within a week. This was in a high-traffic area, but it's a long way short of its claims. At least it's easy to pop the camera onto the charging cable and replenish the battery. You can also adjust settings to reduce the camera's sensitivity to movement and thus improve battery life by sacrificing some recordings. The Flex also boasts a high-quality microphone and built-in speaker. This means you can hear what's going on in the room or area where the camera is placed, but also you can, in theory, use the camera for two-way communication. Canary recently updated the Flex to allow use of this two-way communication feature via the app, but you'll need to pay a subscription to be able to access it. Meanwhile, other home security cameras like the Logitech Circle do already offer two-way communication for free. As its name suggests, the Canary Flex is certainly a flexible device. It's easy to setup, easy to use, and simple to tweak the settings to your preference. We found the notifications weren't to excess and the recordings were fairly useful. There didn't seem to be too many videos in our timeline that included recordings of curtains twitching in the wind or changes in sunlight – an issue with plenty of other similar products. There are plenty of other neat little additions that make a difference, too. Canary includes an "emergency call" button within the live feed and timeline so you can quickly get hold of the emergency services should the worst happen. It's also easy to download and share videos to social media or other apps – though we did find it took a bit longer to get them from the cloud than with other cameras we've tested. Canary Flex does currently lack a web login – so you need to use the app to review live video and your timeline, you can't do it in a browser. This is a shame because it is something that other manufacturers like Nest and Logitech provide. As standard, the Canary Flex offers 24-hours of video history for free. That's handy, as Nest only offers three hours of snapshots (without a Nest Aware subscription). If you want more than that from your Canary Flex then you must sign-up to the membership plan. It costs £7.99/$9.99 a month for a single device. With that membership, you'll get 30-days of video history, unlimited downloads, an extended warranty and more. It is worth noting that the timeline is limited to 24-hours on the free plan, so if you have multiple Canary Flex cameras then this time is spread between them. This means if you have two, you'll only get 12-hours of footage. More devices equals less footage, unless you pay the additional subscription costs. All-in-all the Canary Flex is a simple, frills-free connected camera. It's affordable and it's certainly easy to use, but it's lacking in some key areas compared to the competition. The lacklustre video quality and issues we saw with varying light levels are its biggest problem. The battery life also doesn't last as long as we had hoped (but it's easy to recharge). Fix these two points in the next-gen version, however, and the Canary Flex will be a stronger consideration. That's not to write-off the current Flex, however. We think the app is well-designed and feature rich, having a battery on board adds potential flexibility for placement, you'll always get 24 hours of captured footage (which walks all over Nest) and if you subscribe for the 30 days of footage then Canary is cheaper than much of the competition. Those positives are great - but without the video quality to match its supposed flexibility is somewhat limited. Though it lacks the ability to be used outdoors, the Netatmo Welcome is still one of the best smart home cameras we've reviewed. Fantastic facial recognition being the highlight that and the lack of subscription costs often seen with the other cameras on the market. We found the Withings Home to be a lot more than just a smart camera, it's nearly an all-in-one smart home solution with a great design and plenty of features too. Again, this one is only an indoor camera, but it is certainly well worth a look. Nest Cam Outdoor is exactly what you'd expect, an outdoor camera with a similar cloud-based storage functionality as the Canary Flex. It too has its failings but it does deliver excellent quality video and superb email and in-app notifications.